Tusen tack till min Nordisk Hemmelig Venn 2! Do you know what, my secret friend: I only know that you live in Norway and that you want me to crochet. You didn't tell me your name! 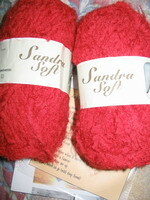 I got two balls of Sandra Soft yarn (100% micro polyester) and a pattern for a crocheted scarf (in Norwegian, but I'll figure it out) as well as a Josh Groban CD. I do like his voice, and I surely needed some soothing music to listen to at work. Thank you!